"Come, look! The grapes are painting the metal of the crusher purple! I have never seen that"
Agustín Lanús is an Argentine Agricultural Engineer, Sommelier and Master of Science in Viticulture and Oenology from the highly respected Vinifera EuroMaster program, completing his studies in Montpellier and Bordeaux, France and in Asti, Italy. Before and after completing his master’s degree in Europe’s most prestigious program for winemaking, Agustin worked in wineries around the world, including Ceretto, Alba, Italy; Chateau Beychevelle, Bordeaux, France; Rutini, Tupungato, Argentina; Bodega Burdigala, Toro, Spain; Lurton, Douro, Portugal; KWV, Paarl, South Africa. 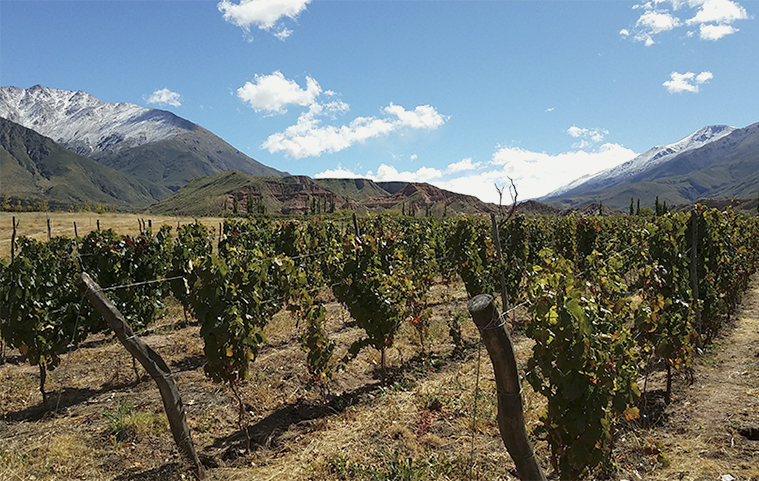 In 2006 Agustin travelled to Salta Province, Argentina with the specific goal of exploring the unique micro-terroirs found in the extreme altitude regions of the Calchaqui Valley. These terroirs, ranging from 1,650 to 3,100 meters above sea level, host some of the highest vineyards in the world (see map). By contrast, the highest commercial vineyards in Europe are found at 1,300 meters. In this website, we present the Agustin Lanus portfolio of high and extreme altitude wines, a body of work shaped by a passion for creating extraordinary wines by extending the range of what’s possible. A small handful of Calchaqui Valley winemakers are currently producing wines from vineyards at the very limits of where grapes can be grown. These vineyards are located in extremely isolated locations, making the time, resources and costs of sustaining the vineyards a challenge for even the most ardent oenologist. Yet the superior quality of the wines produced warrants the effort as the extreme temperature variances, higher levels of solar radiation and the long maturation period results in highly concentrated and complex wines. Producing wines at extreme altitudes regards a rare dedication and willingness to bear the risks that the grapes won’t mature in time, before winter returns. Identifying micro-terroirs in the extreme altitudes with optimal conditions is a search that has consumed winemaker Agustin Lanus for over a decade. At this writing, Agustin and team are making premium wines from vineyards located in extreme altitude micro-terroirs in three of the Argentine provinces which touch the Calchaqui Valley: Salta, Catamarca and Tucuman. At Agustin Lanus Wines we believe the quality of the wines produced are worth the extraordinary effort and risk of producing wines from the limits of what is possible. Every bottle of our limited production high altitude and extreme altitude wines is proof positive the effort is warranted. Additional reading: Exploring High Altitude Viticulture from Vineyard & Winery Management magazine.